We're on the final stretch of free Monster Hunter Generations DLC, with content due to keep coming up to early 2017. The latest set is distinctly Japanese in flavour, given us a taste of the sorts of outfits, weapons and extras that are no doubt hugely popular in Capcom's homeland. Most notably we have the Hyper Gold Rathian quest, the Yu-Gi-Oh! 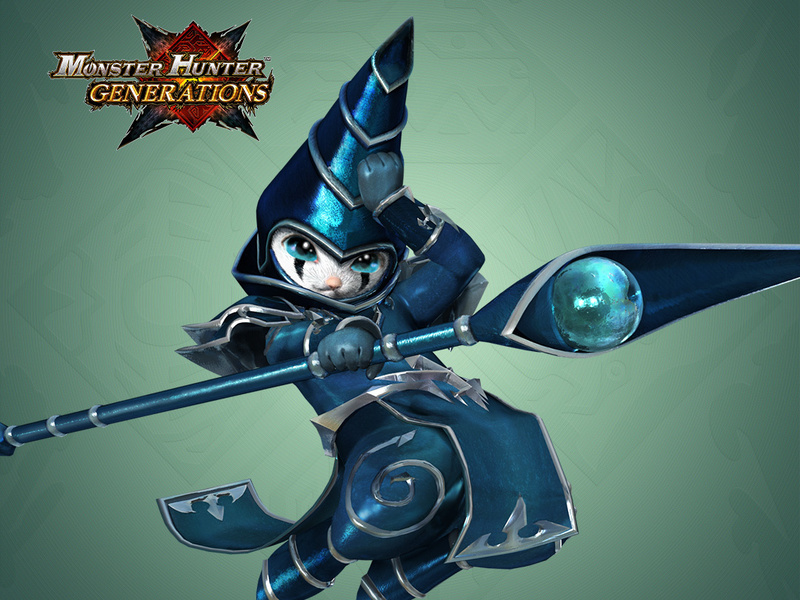 collaboration set for your Felynes and one of the most powerful Prowler skills in the game: World's Strongest! Trade your armor for a great increase in attack and defense. Check out that official page for the full line-up, and this month even has a neat trailer for the content. Notably there's no item pack this time, so if you've burned through the extras from October you'll need to do some old-fashioned gathering, combining and grinding. It's a pretty cool month of DLC for Monster Hunter Generations; we'll see what December brings. Yes there is an item pack! @C0mmanderVide0 and Thomas mentioned it in the article...we got that about a week ago if I'm not entirely off. IS THAT DARK MAGICIAN?! I need to get this game already (im not done with 4 yet). The next one is the last, right? Do people still play Yu-Gi-Oh? I have not heard that name in a long time! Gold Rathian is tough enough as it is. I'm gonna hold off on the Hyper version until I have much better armour or with other players wanting to do it. I happily downloaded this dlc this morning. I needed some new quests to reignite my obsession with this game. You can't grumble about more free content. @Rei I think there might be at least two more. DLC content 'through early 2017', so maybe December and January still to come. @Bananaman678 Yeah, people still play it. May be bigger than it ever was right now. Not necessarily means that it's a good game right now. @Bananaman678 Yes. The game is an absolute mess. Not even one of the people who blindly hates on new mechanics and cards added to the game, like Synchros, Xyz, and Pendulums, but as far as the big three card games (Magic, Pokemon, and Yugioh), I feel safe in saying that Yugioh is by far the most broken and least enjoyable. I feel like it's lost its identity over the years too. I wouldn't usually bring that up because the game is pretty old and change is inevitable, but I'm gonna bring it up because I hate the state of the game as is, so I'm just looking for other aspects to dislike about it lol. @Gorlokk It is quite a mess, but I'll give the current show points for trying. @Bananaman678 yes people still play it and is the biggest tcg in the usa and has been for a while. I'm probably going to trade in my copy of generations toward Pokemon Moon. I haven't touched it in months and once Pokemon comes out I definitely won't be playing it. How the heck did we not get one piece dlc in the last game? Seems unfair that the new game gets Yu-Gi-Oh. I was going to get this later but hearing a G version is coming i might just wait to see if it comes here too. This doesn't make me hate Konami any less than I already do. @Bananaman678 While in holiday in Mexico, there was this building I visited with tons and tons of videogame seller stands over 5 floors, but the 3rd floor had many full tables of people of different ages playing YGO. They also still hold the World Championships like the Pokemon TCG, so its still played and collected somewhat. There's even a new movie of the anime coming in January based on the original series, so it has Yugi, Kaiba and the other original characters. i may of been wrong as well, upon new information as Tsurii said : Thomas mentioned it in the article...we got that about a week ago if I'm not entirely off.